Video Capture Card is a device that captures video played on your computer from TV, gaming consoles, movies or any other input. A popular type of Video Capture Card is TV Tuner Card which is generally used to view and record movies or to watch TV on a computer. 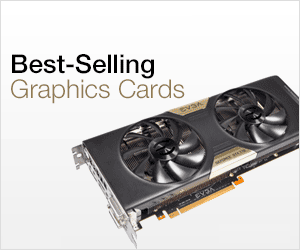 A Video Card should not be confused with Video Capture Card because a Video Card or Graphics Card is used to output or play video from computer to your monitor while Video Capture Card is used to record or capture video from the input source. However, you will require a powerful processor and graphics card for smooth functioning of the video capture card. The most common use of video capture card is to capture video and audio for internet video streaming. It is also used to capture gameplay videos from consoles and videos from DVR. Here in this post I am going to provide you the best video capture cards for professional video recording and other video capturing work. Here are the best internal video capture cards and TV tuner cards that you can use to record or capture videos in HD / 1080p on your PC. Internal Video Capture Cards or TV Tuner Cards offers better performance and features over a USB Video Capture Card. The first video capture card in our list is Hauppauge Colossus 2. Hauppauge is an American electronics company that is known for making high quality video capture cards and TV tuner cards. Hauppauge Colossus 2 is a HD Internal Video Capture Card that allows you to record your TV programs from cable TV, DVR or satellite TV box, capture videos from DVR and record Xbox, Playstation or PC game play in HD. Hauppauge Colossus 2 lets you record videos from HDMI (non HDCP encrypted HDMI) and Component Video at 1080p resolution at 30FPS and it also includes HDMI passthrough for watching videos at 1080p at 60 frames per second while recording at the same time. 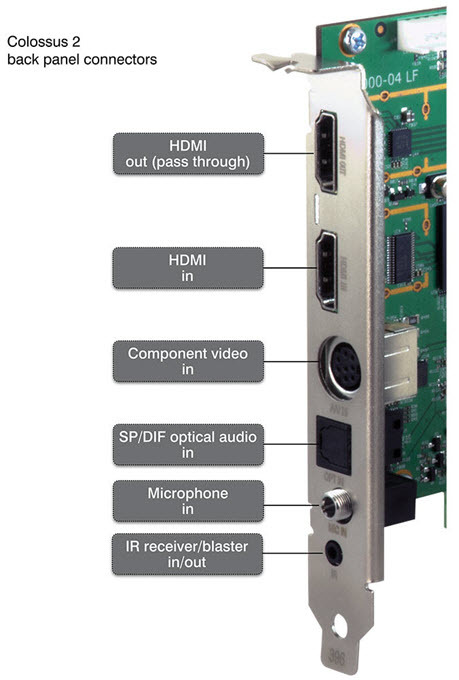 The audio input for this HDMI capture card includes Left/ Right RCA audio input and Optical audio input. It also has an IR Blaster in/out port for controlling your cable or satellite set top box from the card itself. The video capture card has built-in hardware support for H.264 Variable bit rate (VBR) and Constant bit rate (CBR) encoding, video downscaling, and a logo inserter for putting ‘bugs’ or logos on your recordings or video streams. It uses a high quality Analog Devices video front end, and a Magnum studio quality video encoder. The Magnum encoder supports data rates are from .2Mbits/second to 13.5 Mbits/sec CBR, with VBR datarates running to about 21 Mbits/sec. Below you can see the various input and output ports of this video capture card for PC. This video capture card includes StreamEez to stream live videos on internet. It also includes Personal Logo Inserter, so that you can add your own logo to your video recordings and Twitch and Ustream channels. 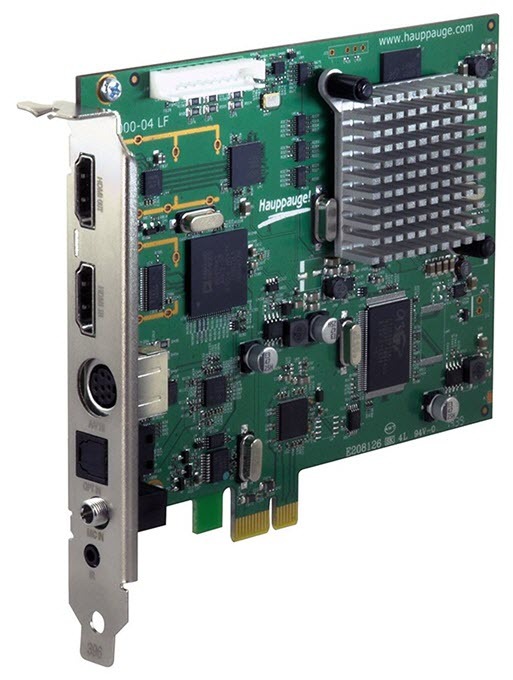 The bundled software applications with this card includes Hauppauge Capture for video recording, trim and streaming with Hauppauge’s StreamEez application and Hauppauge WinTV v8 application with support for the Hauppauge IR blaster. You may have to download the softwares from Hauppauge official website. This video recorder card works on both 32-bit and 64-bit versions of Windows. Overall a great feature rich video capture card that is quite affordable too. Highly recommended by me. 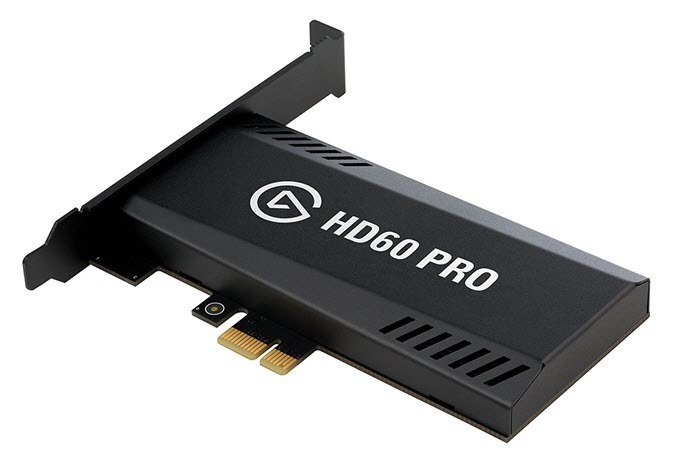 As the name suggests Elgato Game Capture HD60 Pro is a game capture card for recording games in high definition (HD) for streaming or for other use. This game capture card can record game play at 1080p resolution at 60 FPS. It comes with one HDMI in and one HDMI out (pass-through) port. This video capture card can record gameplay videos and stream them at the same time. It can record or capture unencrypted HDMI from Playstation 4, Xbox One & Xbox 360, Nintento Switch & Wii U. 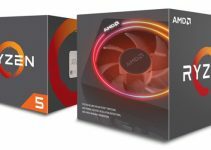 This is a great game capture card for building a game streaming PC for Twitch and other game streaming platforms. Elgato Game Capture HD60 Pro comes with an advanced H.264 encoder that enables you to record unlimited footage in 1080p60 quality at 60Mbps bit rate while keeping the file size and CPU load minimal. The card comes with built-in live streaming to Twitch, YouTube along with live commentary feature. 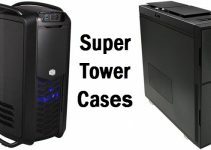 It requires a PCIe x1/x4/x8/x16 slot and Windows 10 operating system for its working. So if you are looking for a high quality game recording internal video capture card for your PC then you cannot get better than this one. This is a great TV Tuner Card from Hauppauge for watching and recording TV shows on your PC. Hauppauge WinTV-quadHD TV Tuner Card is a feature rich and high quality TV Tuner card that comes with four ATSC and QAM tuners. This means you can watch and record up to 4 TV programs at the same time. This is a low profile TV Tuner card and it comes with Half height and full height brackets, IR Receiver cable and remote control. This internal TV Tuner card plugs in the PCIe x1 / x16 of your motherboard and it does not need any external power from the PSU. This TV Tuner card comes with an F connector and WinTV v8 application or software which gives you TV-in-a-window or TV full screen, plus picture-in-picture. This is a powerful TV Tuner card and it lets you record TV in HD quality from the HD TV source. It supports Windows 7/8/10 OS and you need a good CPU and Graphics Card if you want a smooth live TV experience on your PC. So if you are looking for a top quality and feature rich internal TV Tuner Card with excellent recording capabilities then you must get this one. This is an affordable HDMI capture card that can capture from HDMI input source at HD / 1080p resolution. AVerMedia DarkCrystal HD Capture Pro video capture card can capture videos from HDMI (un-encrypted) and from analog connections. There is no HDMI pass-through in this HDMI video capture device which is one of its disadvantages. But you may use a HDMI Splitter box to view HDMI content on your PC while recording simultaneously. The Input-Signal supported by this video capture card includes S-Video, Component (YPbPr, 1080i/720p), HDMI (1080i/720p), Analog Audio L/R site (RCA) and various resolutions supported are 480i / 480p / 576i/ 576p/ 720p / 1080i (50/60 Hz). This video capture device does not support capturing HD content with HDCP (High-Bandwidth Digital Content Protection). The various features of this video capture card includes real-time HD H.264 recording, support for both SD and HD video sources, color adjustment, 4:3/16:9 aspect ratio conversion, youtube video uploading, compatibility with adobe flash media live, watching blu-ray movies without a blu-ray drive. This video capture card requires a PCIe slot and it supports windows operating system. So if you are looking for a cheap video capture card with decent features and recording capabilities then you can buy this one for your PC. So if you are looking for good internal video capture cards or TV tuner cards then the above mentioned capture / TV cards will not disappoint. They are all high-quality HD video capture cards and are compatible with latest version of Windows. 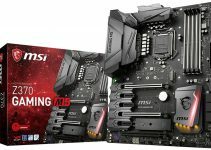 The main thing that you should keep in mind here is that you do require a good processor and dedicated graphics card if you want the best performance from them otherwise you will encounter lags and freezing when using video capture or TV tuner cards on your PC. If you have any queries or doubts regarding them, then feel free to ask me by leaving a comment below.